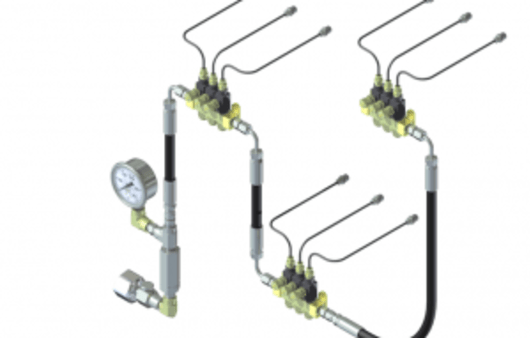 Automated lubrication systems distribute product at intervals to various application points. These systems use a series of grease pipes to distribute the lubricant. These are often very thin and long in order to keep the area organised allowing lubrication in difficult to reach areas. The main problem with these small pipes is that they are liable to splitting when conventional greases are used. Split piping occurs because grease is a thick substance and is difficult to pump through piping. The incremental increase of grease into the piping system leads to a build up of pressure which can lead to a burst pipe. The aesthetic requirement of machinery is leading to the use of smaller grease pipes which in turn will increase the pressure these pipes are under due to the reduced space for the grease to flow in. Piping is the principal method for the distribution of grease to the required areas of production and machinery. These systems are often automated and as such, problems can go unnoticed. The consequences of this are; frictional wear and frictional heat increase, failure of the machine or breakage of a particular part. The knock on effect of this is production downtime and also the replacement of a potentially expensive piece of equipment. Therefore, it is vitally important to be able to provide a reliable solution that will not place piping under dangerous levels of pressure. Using small bore pipes helps save space and effectively provides small quantities at varied intervals for many lubricant applications. The problems arise when the inner size of the pipe becomes too small to cope with the thickness of the substance that is being pushed through. This often occurs when space savings are made and the pipe diameter is reduced, consequently reducing the size of the inner bore of the pipe. Another complication within all of this is that because the pipes are small and often located in difficult to reach areas it could become laborious and costly to replace the pipes so, it is worth while ensuring that they are not placed under unnecessary pressure. Lack of knowledge on the required application of the grease. Lack of knowledge on the performance and characteristics of the grease. Over supplying the lubrication system with grease. The issue being that the small bore pipes can only withstand a certain amount of pressure and can only contain a certain amount of substance. If the grease is too thick for it to pass through the system then it will burst the piping as a result of built up pressure. In response to the problem that occurs with small bore piping ROCOL has developed FOODLUBE® Auto SF for food-processing environments, the SF standing for Semi-Fluid. This semi-fluid solution fulfills the purpose of any equivalent grease but has one key advantage; it can be pumped through piping systems easily whilst providing the same lubrication capabilities. This helps to eliminate the problems associated with solid greases such as burst pipes, machine failure, contamination etc. This product has been uniquely developed for this application and was created in an innovative way. Normally, greases are diluted by adding oil, but this only increases the amount of substance that would occupy the space in a pipe. It was decided that the easiest substance to pump through a piping system is oil and this should be used as a starting point. By using oil with additives to provide the correct lubrication and then adding a gel to thicken the oil, the issue of dripping associated with oil has been eliminated. The adhesive properties of the gel help the oil adhere to the machine parts which reduces the amount of dripping and consequently potential contamination within food-processing sites. As a result a semi-fluid lubricant can be pushed through pipes very easily. Also, the gel sticks to the machine part resulting in a longer lasting supply of oil, resulting in reduced frictional wear, ultimately maintaining the machinery to a higher standard and reducing the risk of lost production. This is the ultimate solution to all the problems associated with bore grease pipes and ROCOL believes it is the most successful way of providing consistently high-grade lubrication to machine parts whilst reducing the maintenance issues associated with small bore tubing.